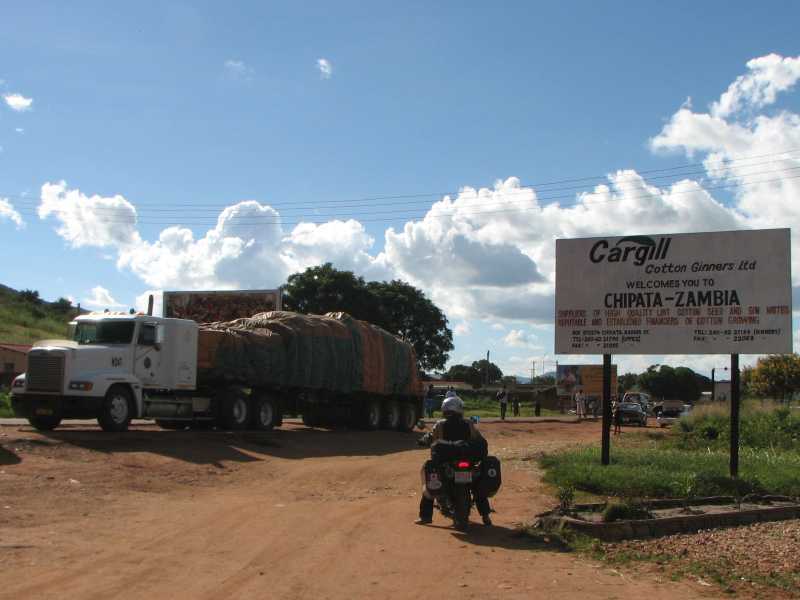 The border crossing into Zambia was straightforward, and we only had to wait for one official to get back from a lunch break. 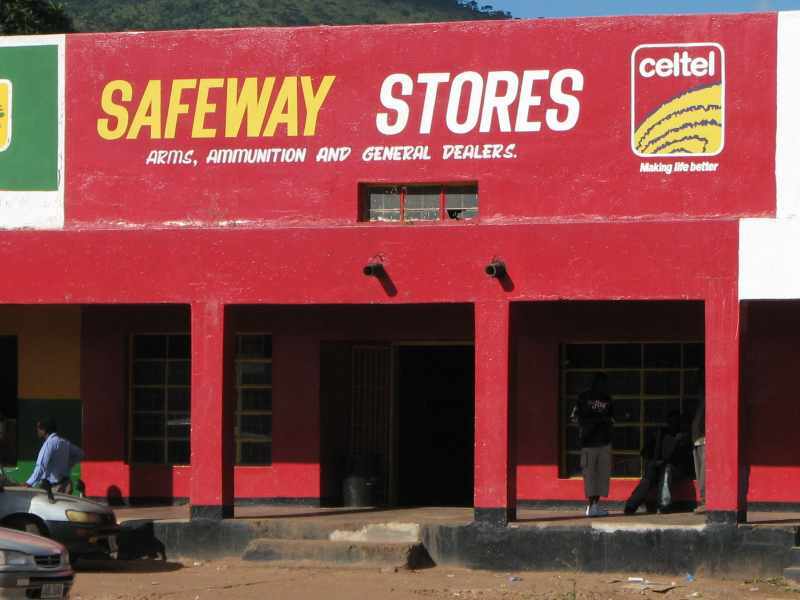 The black market guys hovered around like vultures, with fistfuls of kwachas, trying to get us to trade our Malawi kwachas for Zambian kwachas at a bad rate. 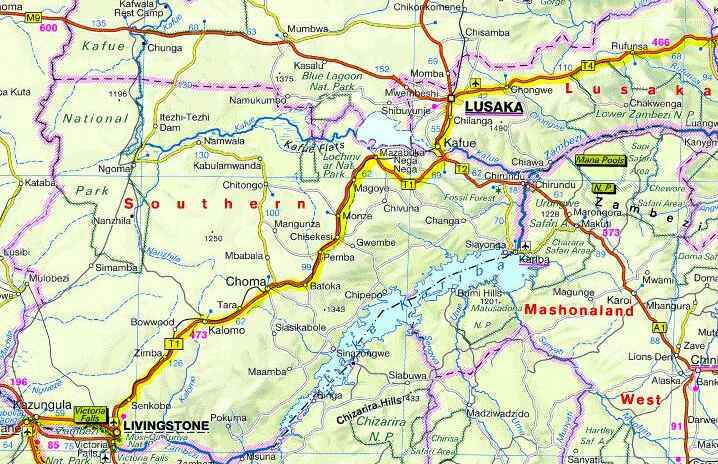 As you know Ekke loves to say 'kwachas' so he was delighted to discover that the currency in Zambia was also kwachas. Lucky for us we knew the exchange rate, as we would have gotten totally ripped off by the black market guys. 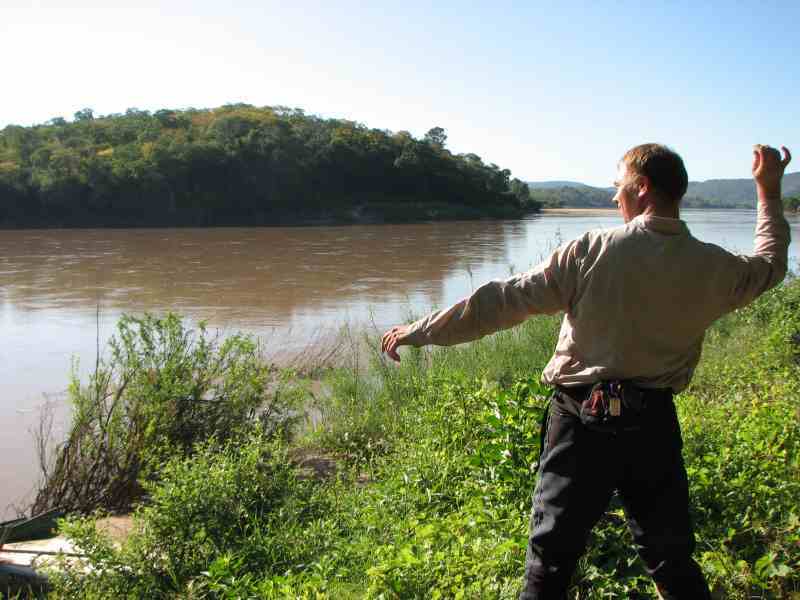 The border officials wanted $50 US for a tourist visa, and wouldn't accept Zambian kwachas. The carbon tax was a bit of a surprise, 50 000 kwachas ($15) for each bike. 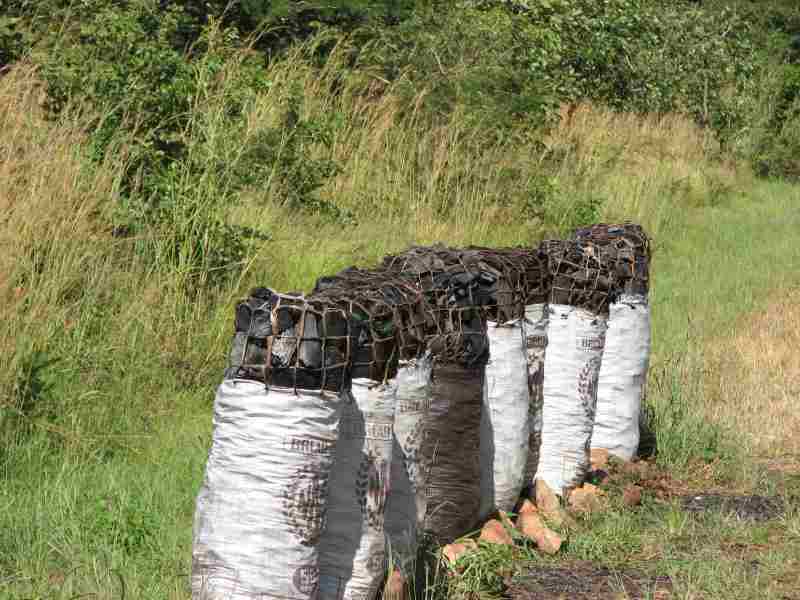 Judging by the black smoke belching from a lot of vehicles, we could see that the money was being put to good use. Mama Rulas Campground was quite a nice place, with great facilities. Ekke had another encounter with the 'hold-back' and had to ask for change after buying a couple of ginger-ales. 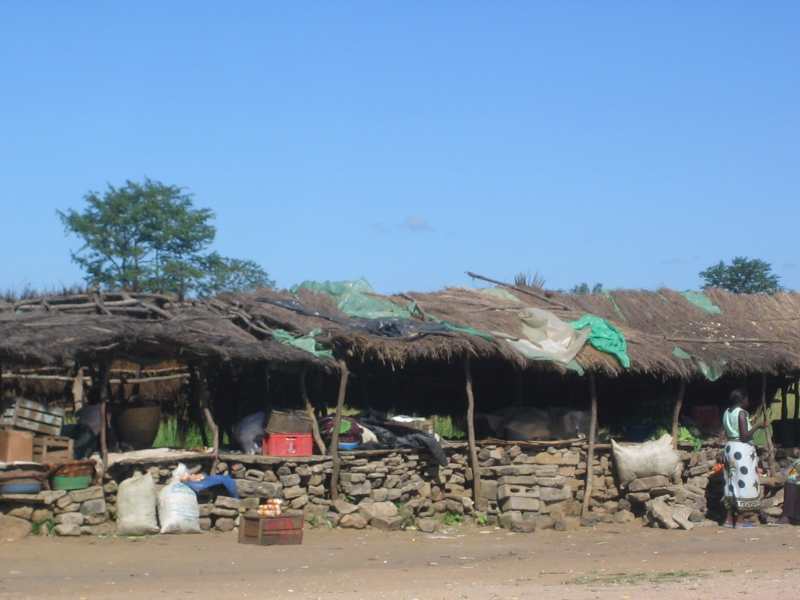 Just as we were enjoying our own cooking, we heard the familiar roar of a truck - a group of overlanders was pulling in. These 15 seat vehicles usually carry a raucous group of youngish people across Africa, and this one was no exception. They pulled up right close to our tent, the only one in a four-acre field, and then they started putting their tents up all around ours. As we weren't that interested in partying with 19 year olds from the UK, we took our tent down and moved to escape the noise and music. Maybe us 40-somethings just appreciate a good night's sleep. 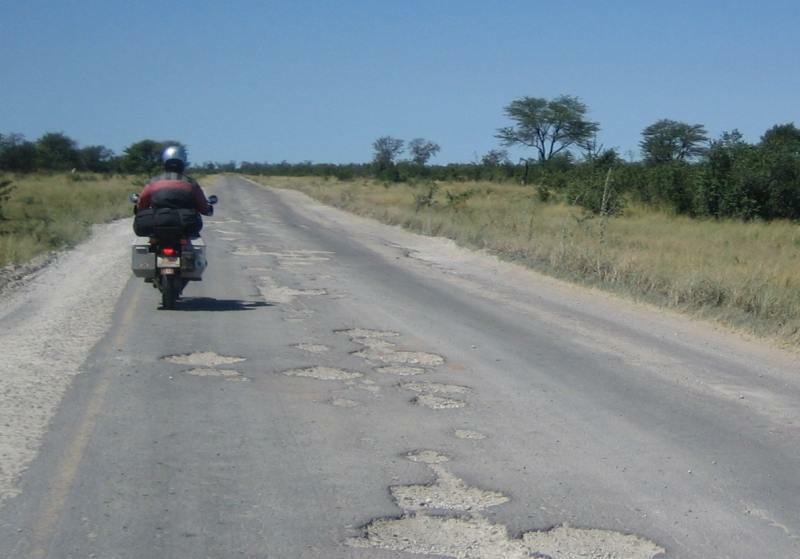 Roads in Zambia were fairly good in some parts and terrible in others. Sometimes a paved, narrow two-lane road had a speed limit of 80 kph, and at other times a paved, narrow two-lane road had a speed limit of 120 kph. Tarmac roads went from perfect blacktop to potholed messes. But, at least the weather here was perfect, with every day offering sunshine and blue skies. 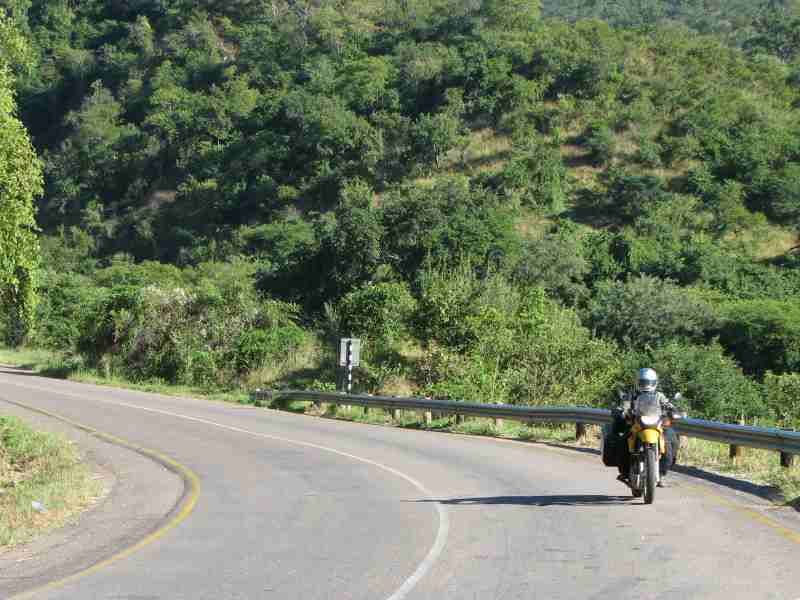 Riding was often effortless as we wound our way through small forests and past fields of maize and sugar cane. Roads were dotted with small towns with tiny wooden or brick shops, but occasionally a bigger place would have a Shop-Rite, a real grocery store. We could feel ourselves slowly getting into a more 'civilized', if you will, Africa. 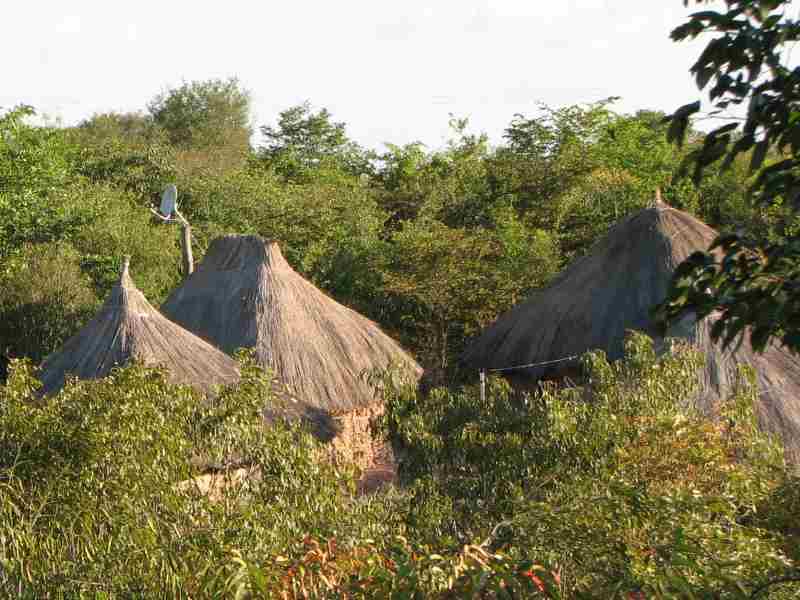 Still lots of thatched huts, though but some with a modern touch. 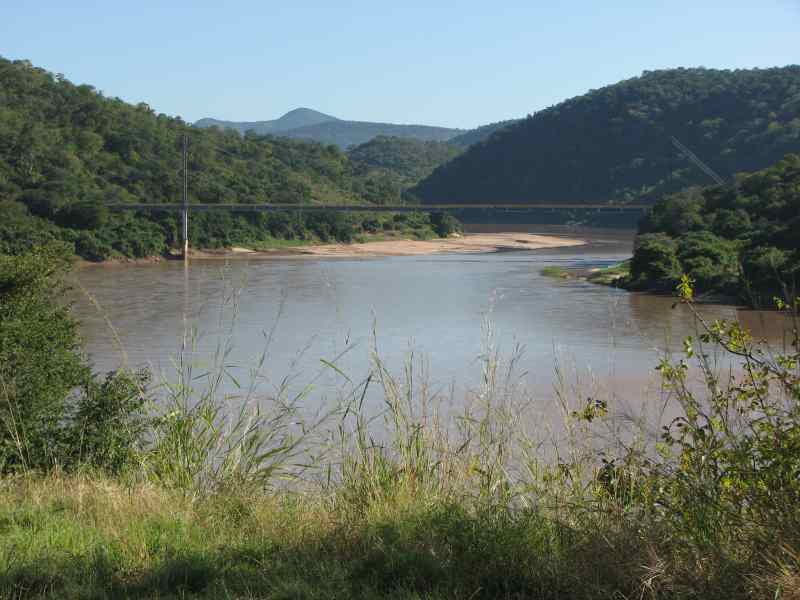 Ekke and I approached the Luangwa Suspension Bridge, an impressive structure over the Luangwa River. A car ahead of us had his flashers on, but we didn't know why. About halfway across, we could just see the other side of the bridge, and standing there were two men with guns. When we got closer we could see that it was another military checkpoint. One of the soldiers told us in no uncertain terms that we should have come across the bridge one at a time. He was a bit angry. Ekke was asked where we were from, and if Canada was a beautiful country, and was it more beautiful than this. I think the guy was trying to get us going a bit but Ekke didn't fall for it. In these situations I just say I have earplugs in and can't hear them, and usually they stop talking to me. Ekke just maintained a positive attitude and they eventually let us go. Later, when talking to the campground owners up the road, they said there was no sign indicating that one must cross one at a time. They also said that if people got angry about it, then the soldiers asked them for money. 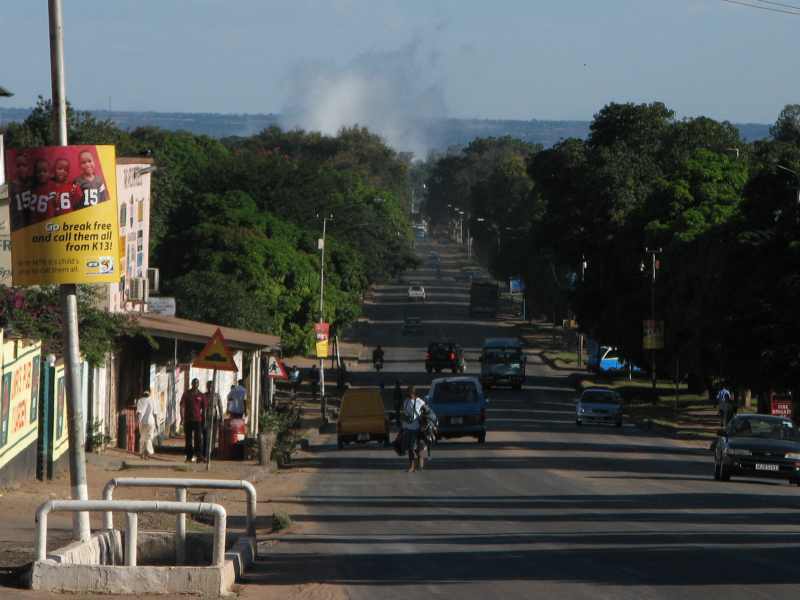 The capital of Zambia, Lusaka, was a pleasant place. We immediately sniffed out a shopping mall with a Super-Spar, a huge grocery store. Prices for food were similar to those in Canada but occasionally an item had a ridiculous price on it. A certain deodorant that I really wanted, and hadn't seen for months, was 43 000 kwachas, or $14.00! I actually considered buying it but then quickly came to my senses. We spent some time at a fast and reliable internet cafe, such a difference from the slow ones we'd been living with for so long. It still took a couple of hours just to take care of emails (sorry if we didn't reply to yours yet - we still love to get your feedback about the website). Super-Spar had a fabulous bakery, and we eyed a couple of Bavarians, a type of creampuff. We couldn't wait, and ate them out by the bikes. A woman came by and asked about our trip, saying she was really impressed. I'm sure she noticed us just quaffing the cream puffs, so I explained to her that we hadn't had them since Germany. "I can tell," she laughed. After cleaning cream off our faces, we rode to Eureka Lodge and Camping, just south of the city and surrounded by a game park. 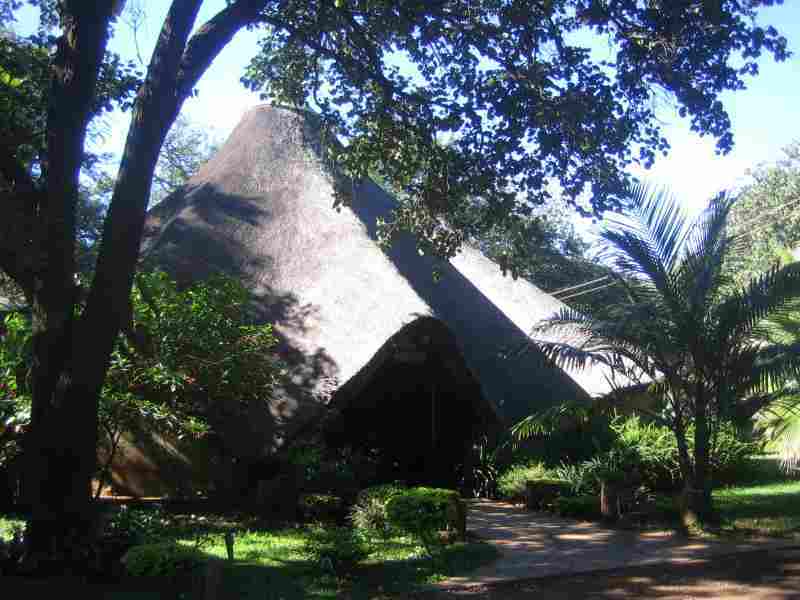 Many lodges here have excellent camping facilities, and always a convenient restaurant. Great for us as the days of $15 hotels are over. 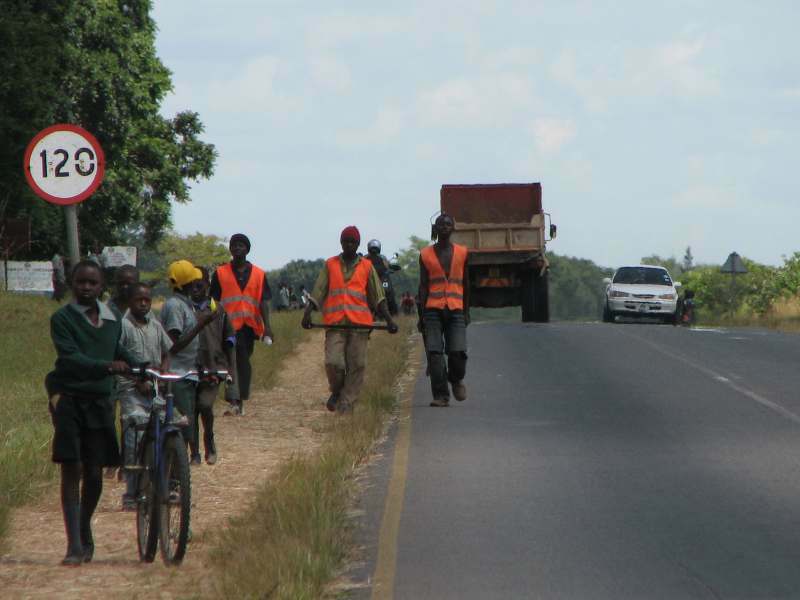 The first 300 kilometres of the road from Lusaka to Livingstone were on excellent tarmac with only a few pedestrians and cyclists to watch out for. We made such good time that we thought this ride would be a breeze. 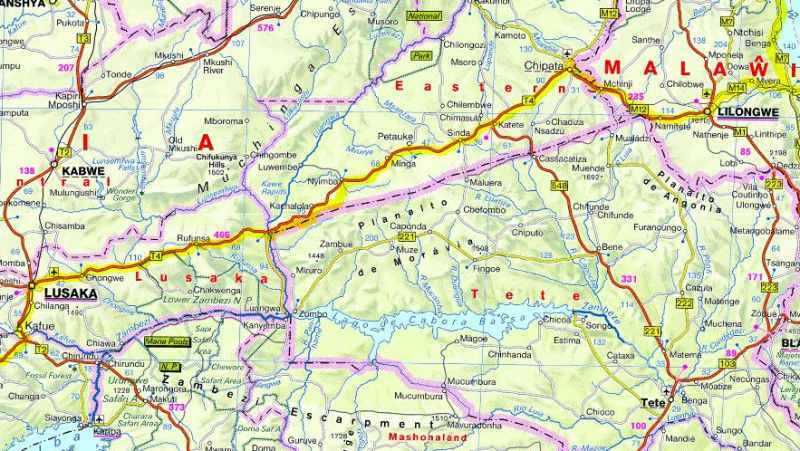 After that, a few potholes started appearing, but were easy and even fun to avoid on the motorbikes. It was almost like a game, swerving for one, swerving for another, slaloming down the road as if we were skiing the Grizzly Bowl at Lake Louise. Road conditions went quickly 'downhill' after that. Potholes increased in size and number until at one point there was more pothole than pavement. Big trucks had just chewed up the tarmac, and were also doing the slaloming thing, though a little less gracefully than us. More like snowplowing down the bunny hill. We knew that if we saw dust up ahead that we would be in for a new set of potholes. But at one point we saw a tower of dust in the distance and it just didn't get any closer, even as we rode toward it. Wait a minute. That wasn't dust. That was mist. 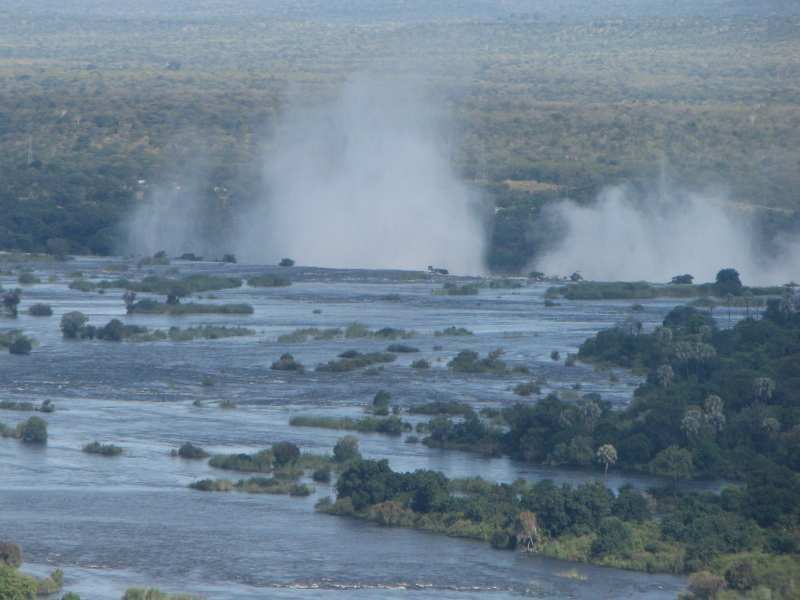 Mist from Victoria Falls, still 30 kilometres away! We knew the falls were putting out a lot of water this time of year, but this was amazing. 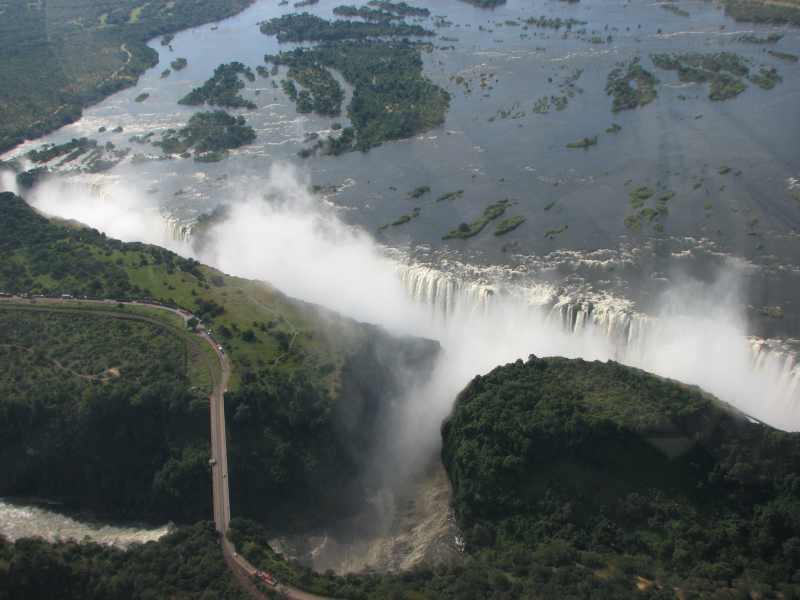 Someone did something right when they labeled Victoria Falls one of the Seven Natural Wonders of the World. 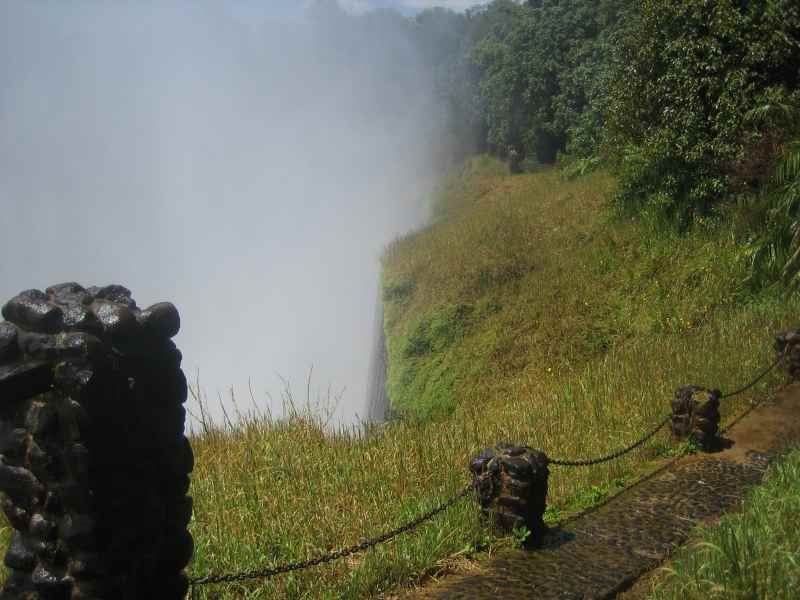 From a lookout point we could see the mist rising from the falls, locally known as Mosi-oa-Tunya, the 'Smoke That Thunders', in the Kololo language. 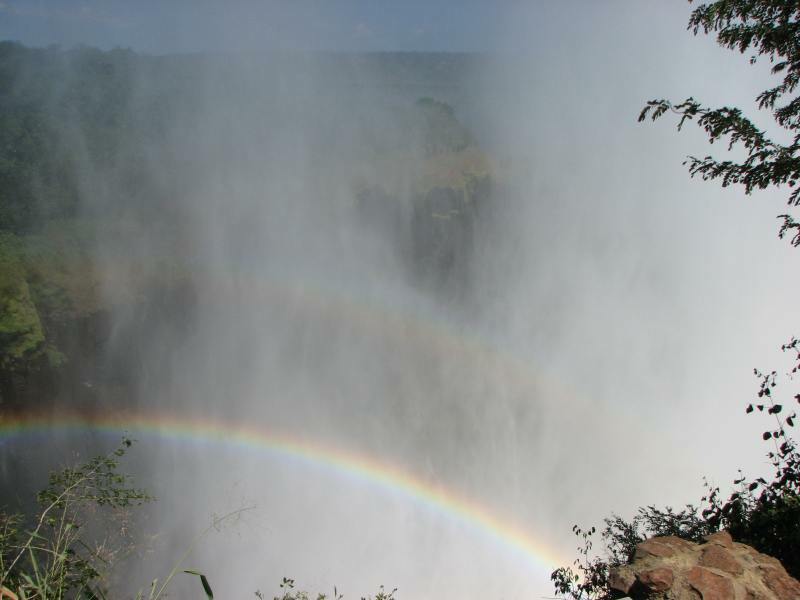 Being here at the end of the wet season did have its advantages, such as watching the billowing towers of mist and listening to the thundering roar of the falling water. 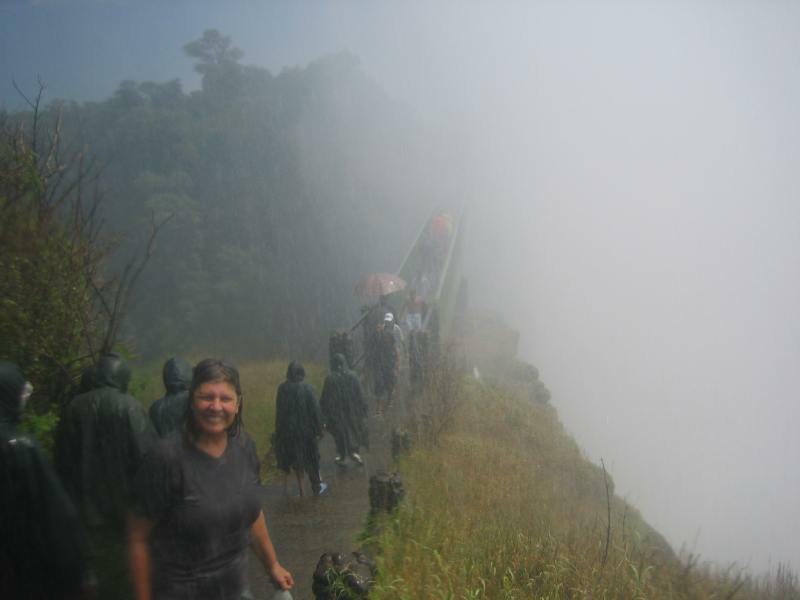 The problem with the huge volume of water was that we couldn't see the falls very well because of all the mist. This left us with a bit of a dilemma. 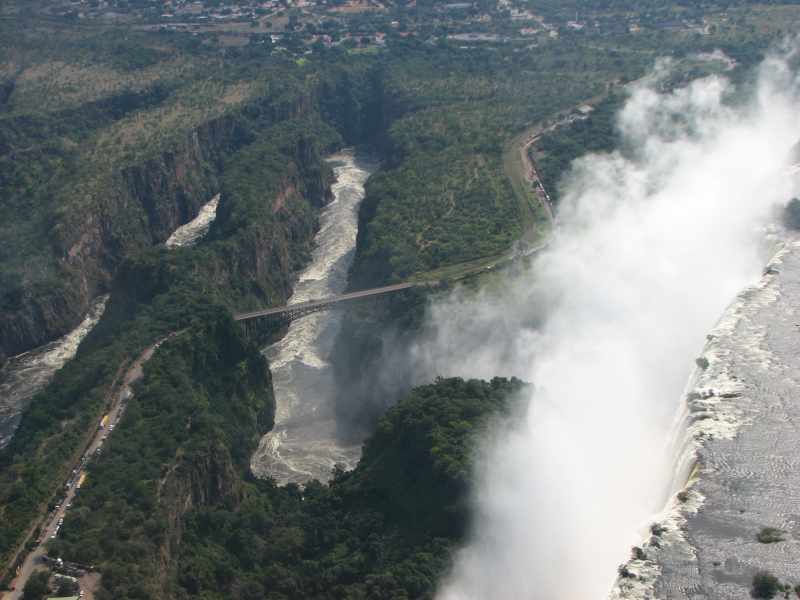 Should we go over to the Zimbabwe side of the falls or not, pay for visas, and risk just seeing more mist? Also, it was Election Day in Zimbabwe, and apparently things could get volatile over there, since the country was crumbling, politically and economically. 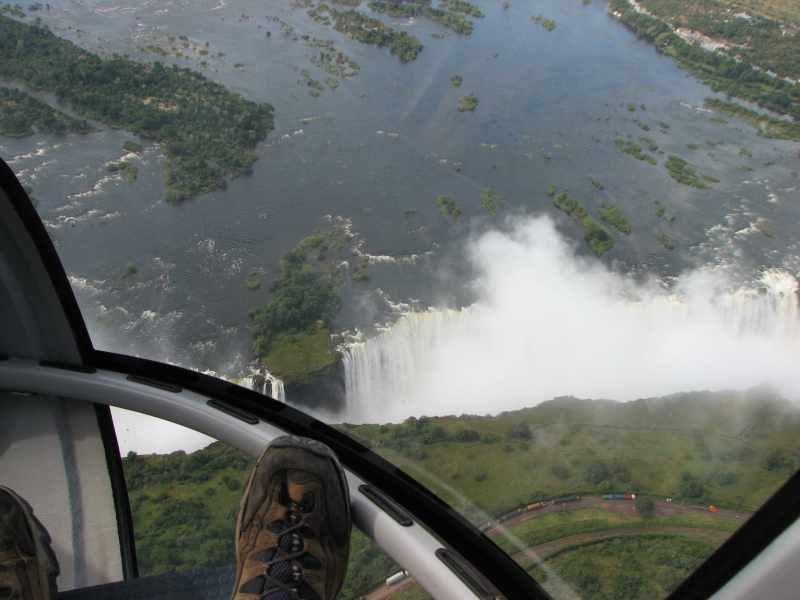 Our campground host at the Livingstone Safari Lodge told us that the best views of the falls would be from a helicopter. 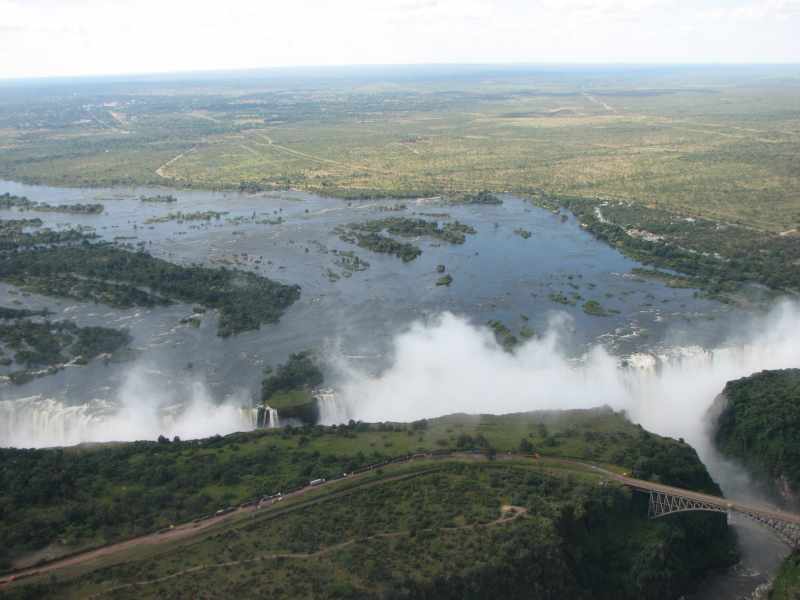 He also confirmed that with the current high levels of mist, you couldn't see much from the Zim side anyway. 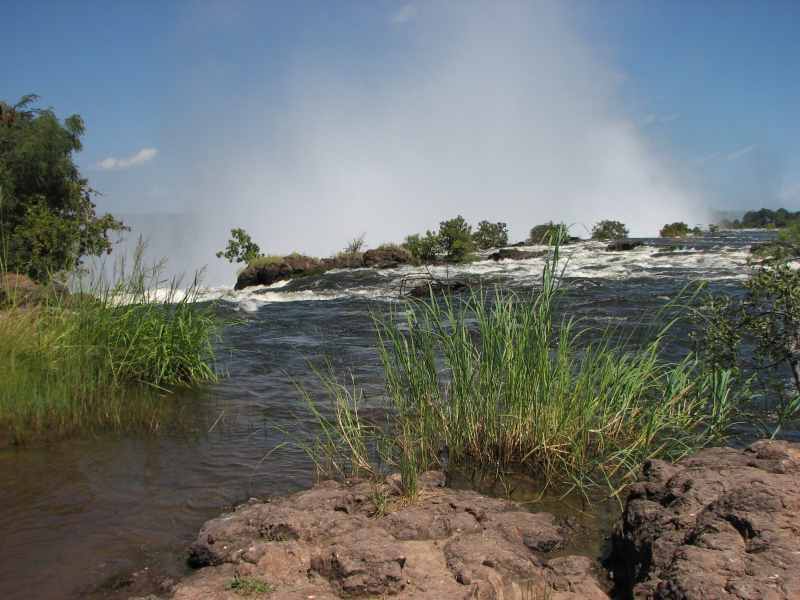 We rode the few kilometres to the Zambian side of the falls and started with a hike upriver. 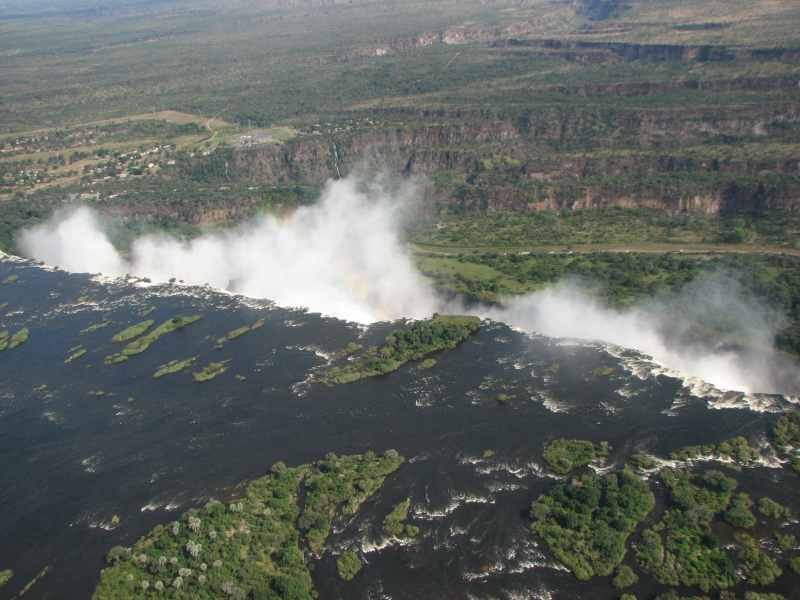 It was great seeing the waters of the wide Zambezi River, just flowing along, until suddenly, the cliff edge appears, the water falling 108 metres to the bottom. We walked around to the ridge across from the falls. The guy renting raincoats was our first clue that it was going to be wet. The drenched hikers coming up the path was the second clue. The stone pathway took us along a high ridge, right across from the 1.7 km wide falls. 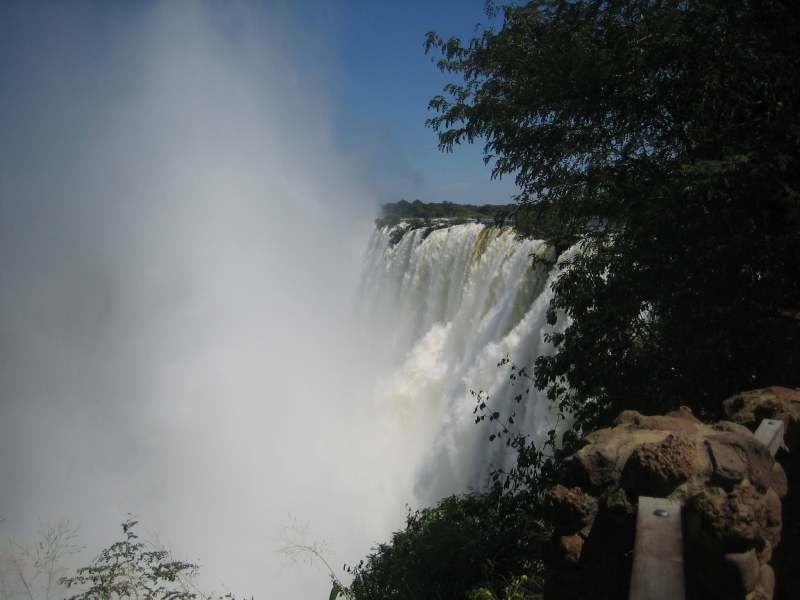 The noise was deafening as one million litres of water per second dropped over the edge. And then we felt the mist. 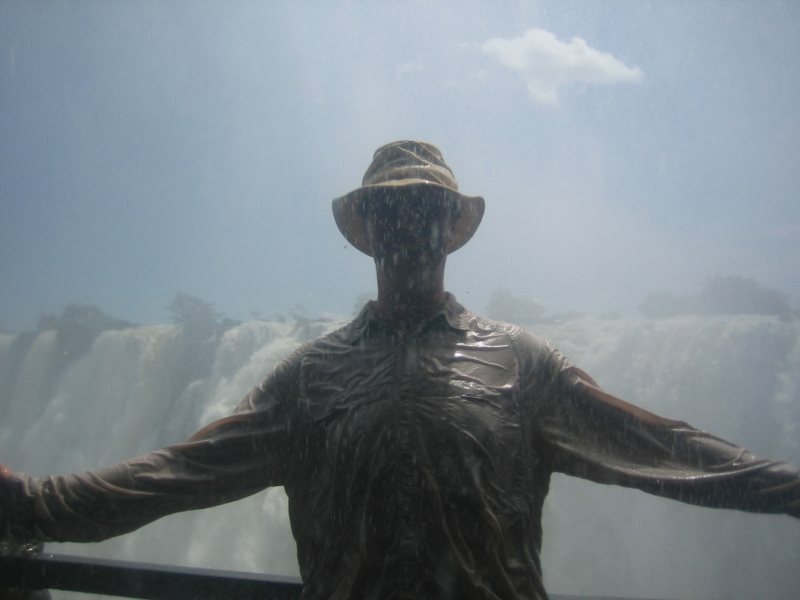 But it wasn't so much mist as torrential sheets of water bombarding us from all sides. There was no escape as we got pelted from above, behind, beside, and even from underneath. What luck to have a beautiful, sunny day so that in the end, being wet didn't really matter that much. 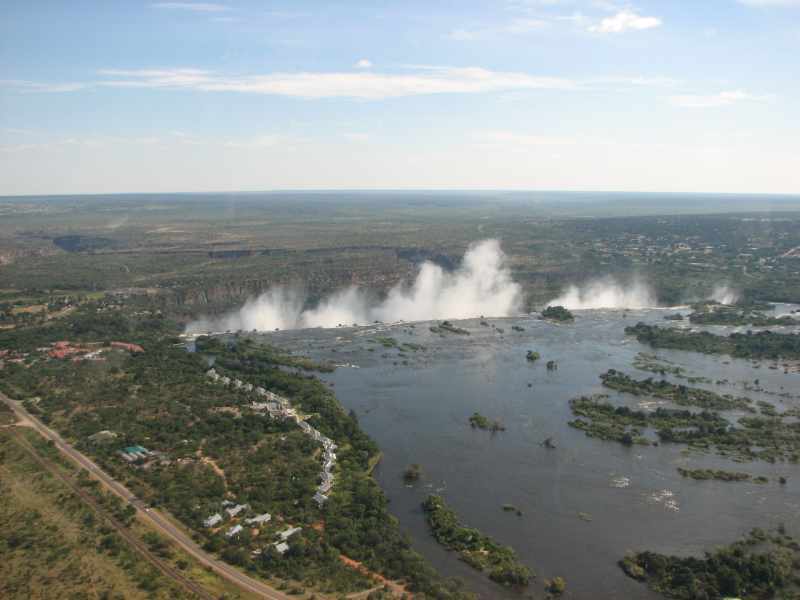 What worried us a little bit was all the Zambezi river water we ingested. It felt like getting dunked in the swimming pool just one too many times. All we carried were our cameras, Ekke's in a trusty Ziplock, and mine in a MEC waterproof sack. A change in the breeze meant that occasionally there was respite from the rush of water, and we could take a picture. 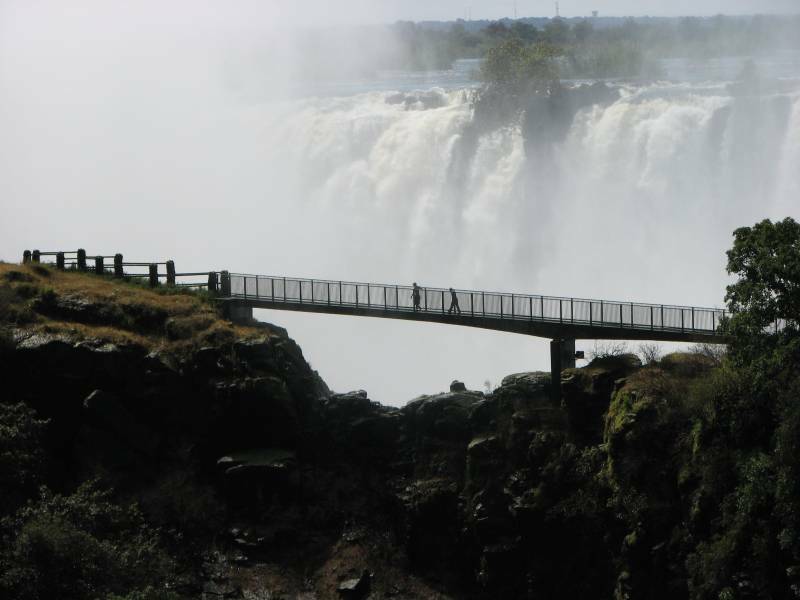 When the mist cleared from the falls, it was an awesome sight. We fought our way through a deluge of water across a footbridge that was really high up. It took us over to another ridge with a sheer drop, called the Knife Edge. The rocky footpath was often covered in green slime and was a little slippery. Someone had thoughtfully put in a few short, rocky pillars and attached a knee-high length of chain to them along the edge. More reassuring than having nothing there I suppose, but I don't think it would stop anyone from going over the edge. 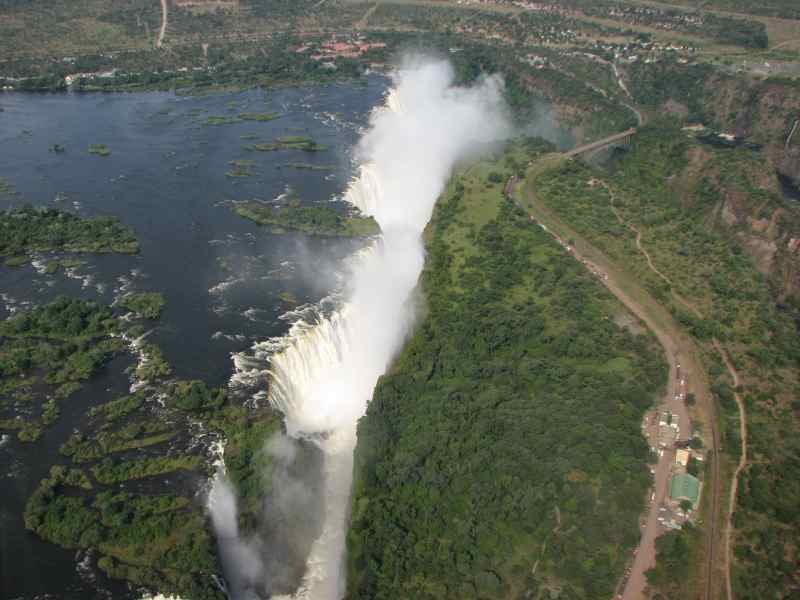 It was all there was between us and the drop-off into the Zambezi. 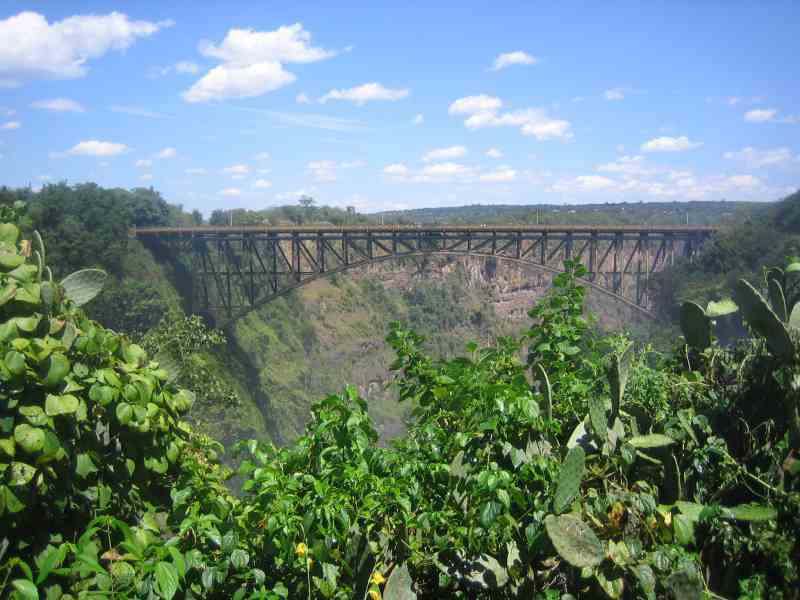 But over on the Victoria Falls Bridge to Zimbabwe we could see people voluntarily jumping off. 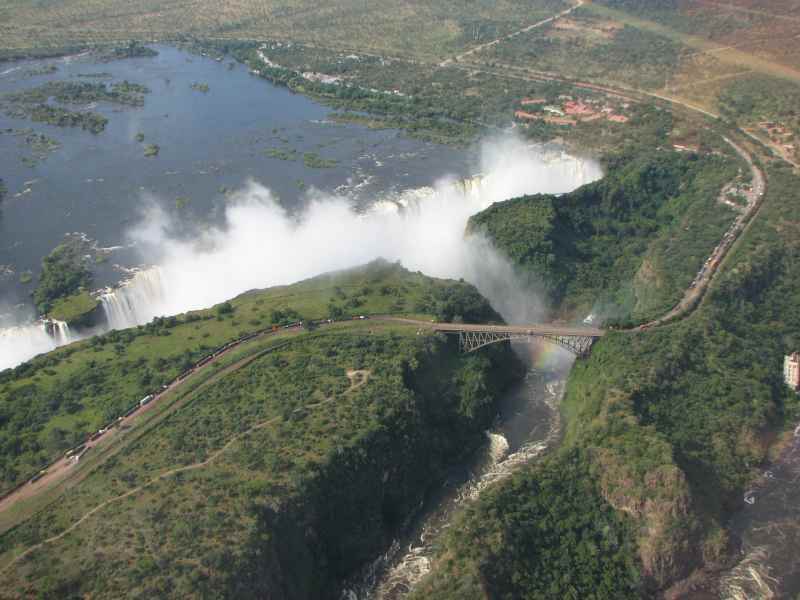 The bungee jump is the third highest in the world. 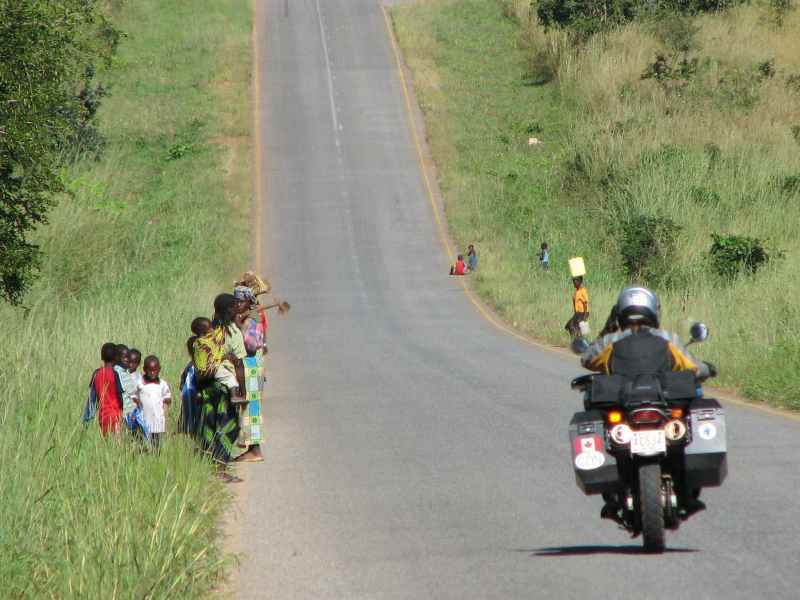 Not for me, but hey - I'm riding a motorcycle through Africa. How much more excitement do I need? Completely soaked within 3.62 seconds! 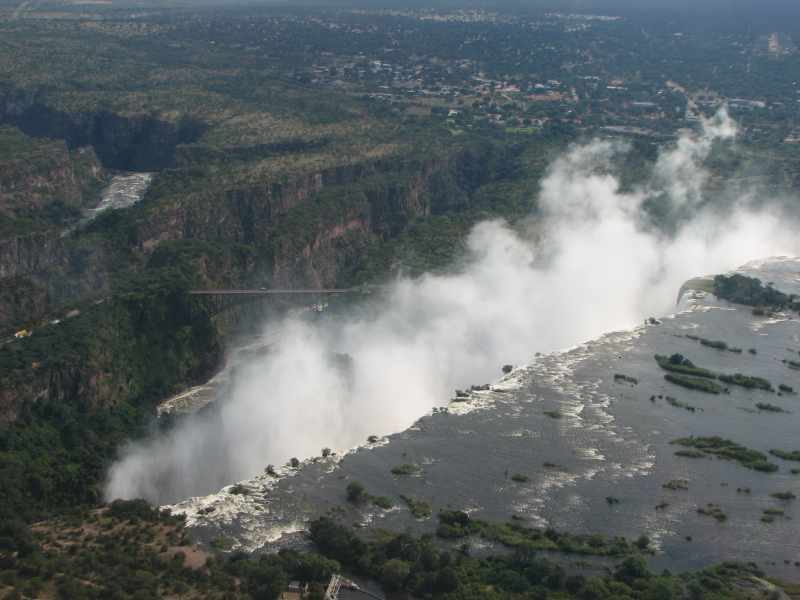 So we didn't go to the Zimbabwe side of the falls, but put the visa money toward a helicopter ride, which came out cheaper in the end. 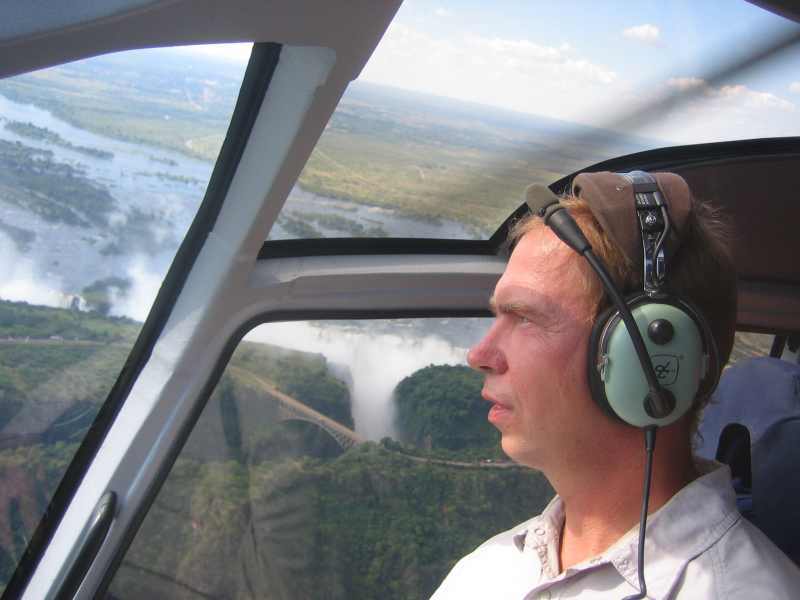 I had been in a few helicopters before, in my Alberta Forest Service summer job, but this was Ekke's first. Any apprehension that he had about riding in a helicopter was soon dispelled when he saw the beautiful looking machine. 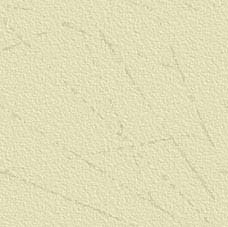 The professionalism of the pilot also did a lot to raise his confidence that all would be well. After she gave us some safety tips, we were on our way. The lift off was smooth, and before we knew it we were cruising over fields and hotels, heading toward the mist. 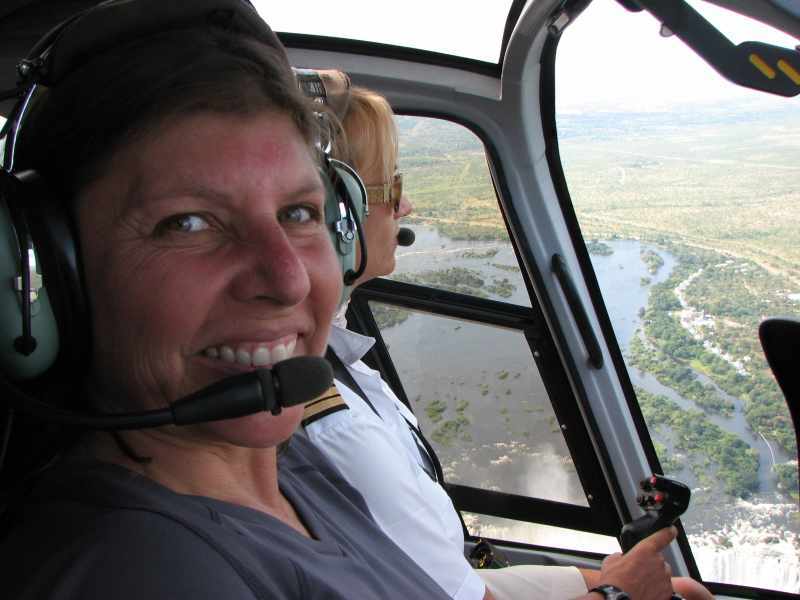 The chopper flew along the Zambezi River and we followed it from our perch in the front seats, looking straight down. We approached the edge of the cliff, closer and closer. 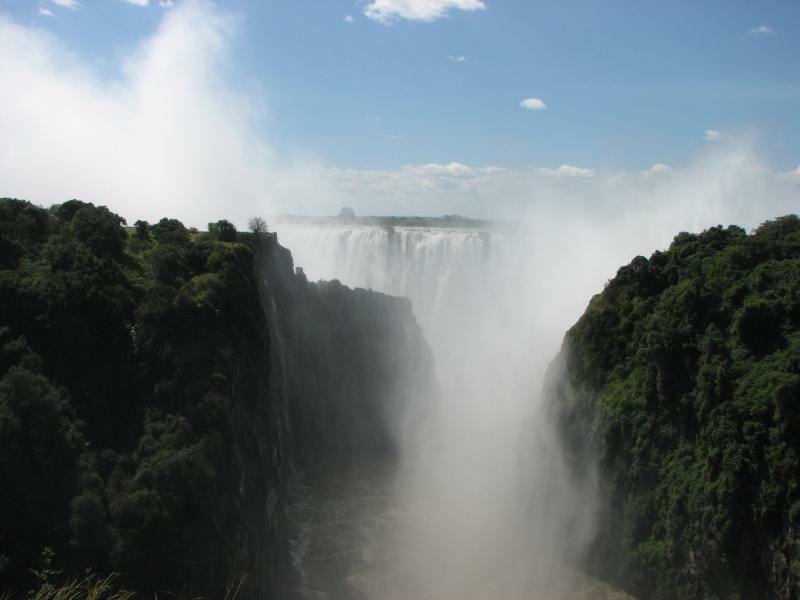 And then the river was gone, having dropped off the edge in a turmoil of water and spray. 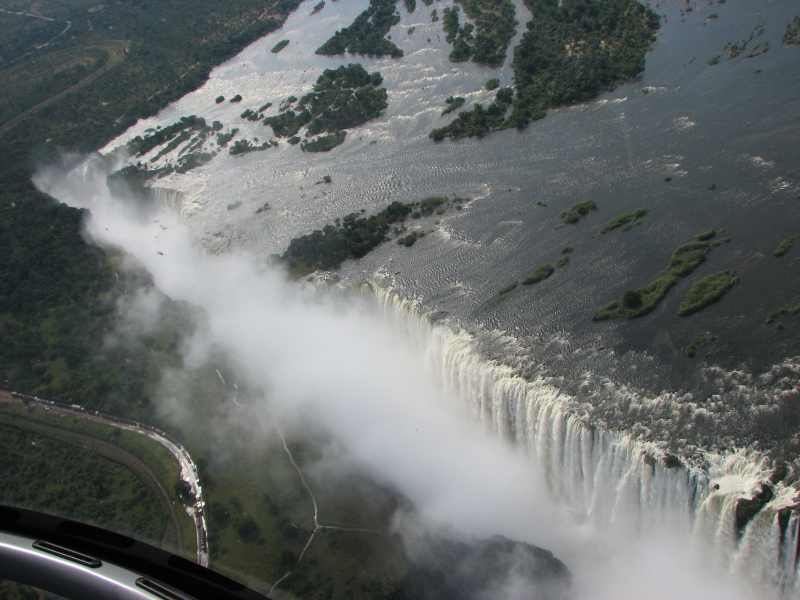 The chopper circled around and we got a complete view of the whole length of the cliff, all 1.7 kilometres of falling water. What a great perspective. The falls were gorgeous from all angles as we did more circling and figure eights. I could have stayed up there all day, but we had only paid for 15 minutes of chopper time ($100 each). 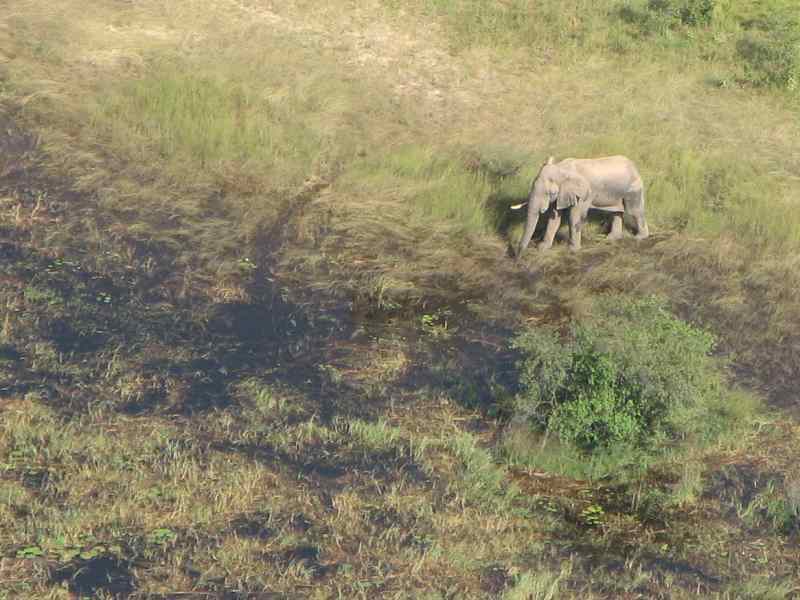 On the way back, our pilot pointed out an elephant lumbering along beside the river. 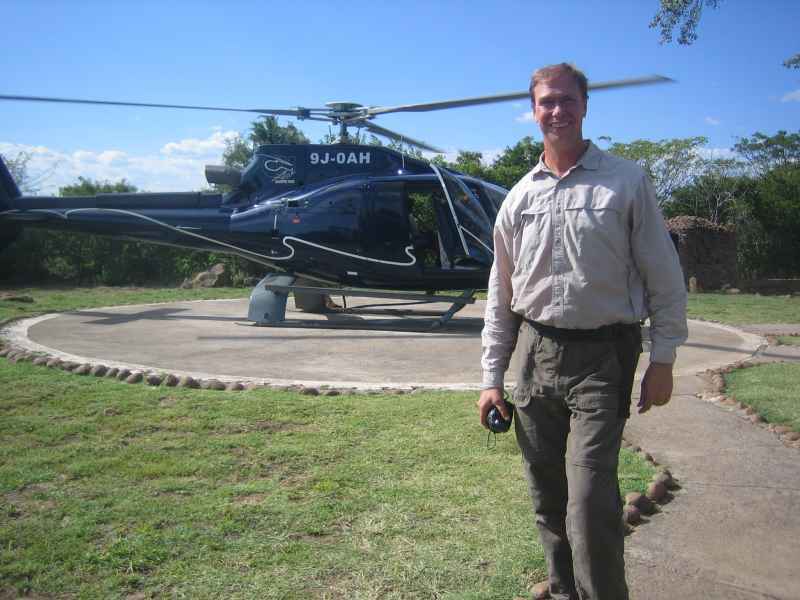 Does this qualify as another type of safari, the 'Helicopter Safari'? Just as we were packing up to leave for Botswana, Ekke noticed that my rear tire was really low again. 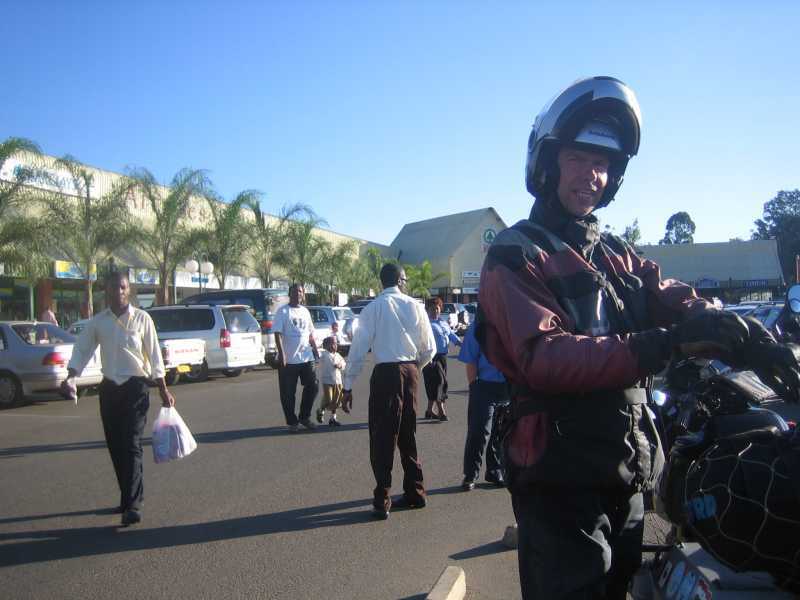 We decided that we could try to get it fixed in Livingstone, and then see if we had enough time to ride. Not being able to find a tube in my tire size, we opted to just get a patch. 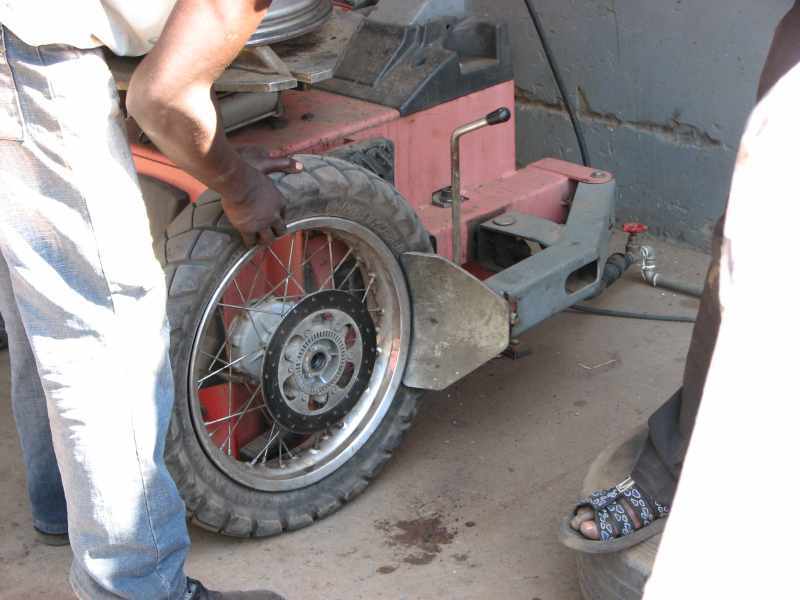 Ekke took the wheel off the bike, and a guy at a gas station 'tyre' repair shop fixed it for us, for 12 000 kwachas ($4). We decided to stay another day, found Rhapsody's Cafe with its long, cool drinks, and worked on the website. What a life! By staying another night we had the pleasure of meeting Andy and Suzanne from Germany. 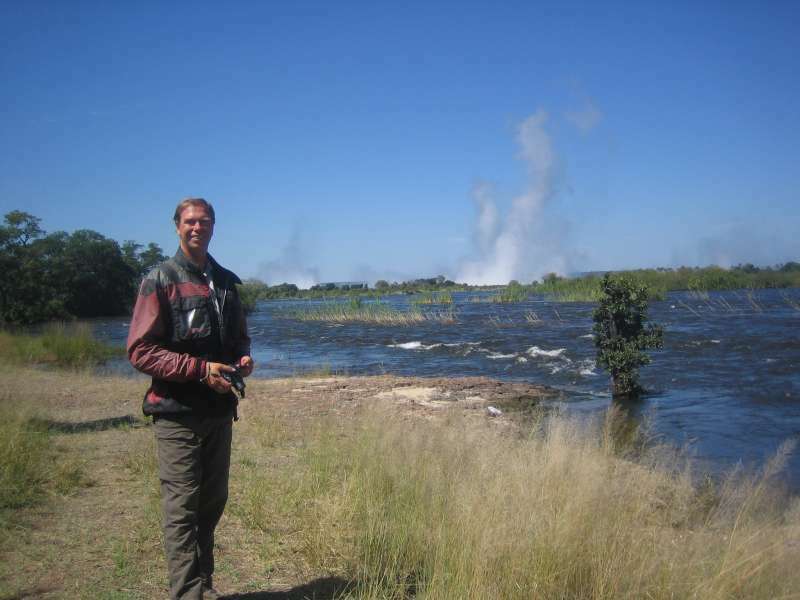 They were riding around Southern Africa on a Honda Africa Twin and a dirt bike. We were chatting about where we were from, when Andy said, "Do you know...?" We immediately thought of those times where as soon as we said we were from Canada, someone would say, "Oh, I have a cousin in Montreal," or "Do you know my aunt in Toronto?" This time, when Andy said, "Do you know Dave Anderson?" we were a little flabbergasted. We did know Dave Anderson. He's the owner of Anderwerks, a BMW shop in Calgary and had helped Ekke do some work on the bike before we left. Andy had met Dave at Intermot in Köln, through Wolfgang, a motorcyclist who shares his time between Canada and Germany. Small world. But I guess when it's the motorcycling community, the world is small. 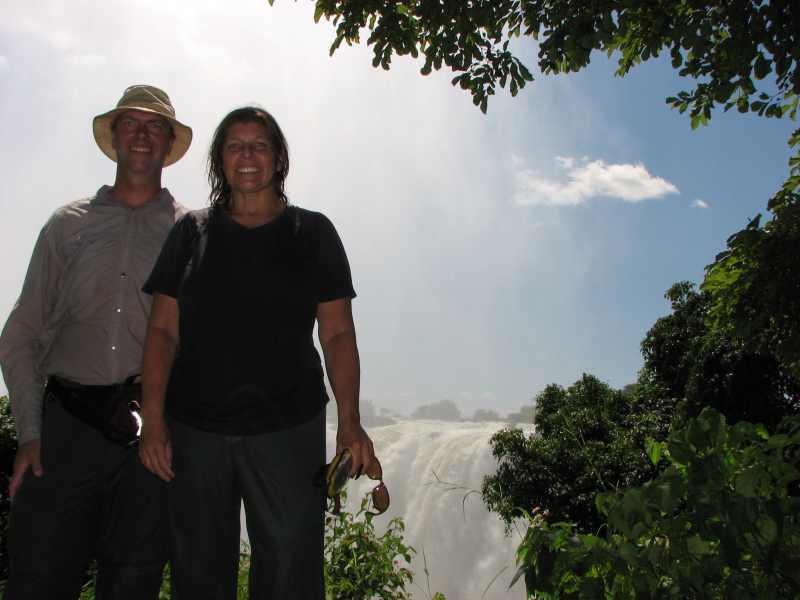 Andy and Suzanne were just off to the police station in Livingstone. They had been caught riding without helmets, and had to prove to the police that they actually had safety gear with them. 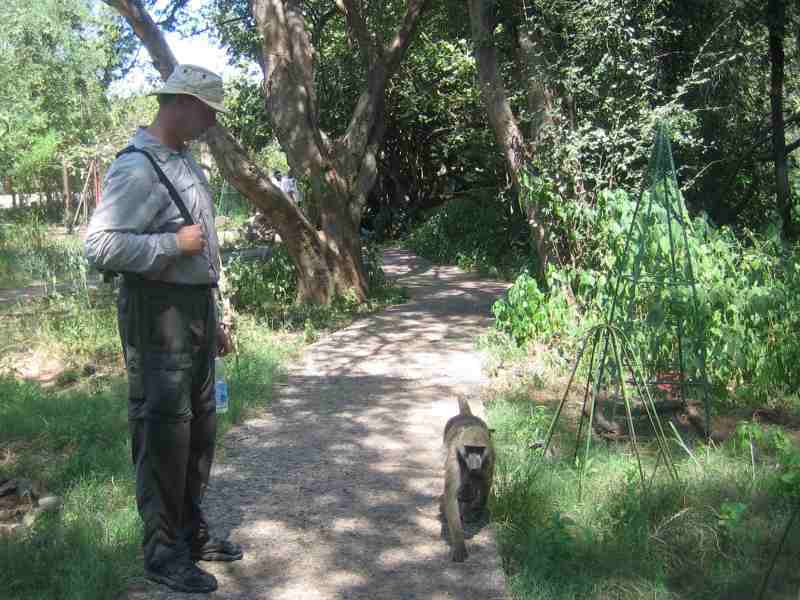 Ekke and I left Livingstone Safari Camp the same morning in the direction of the Botswana border. We had saved up some kwachas because we didn't know what the exit fees would be. It turned out we only had to pay 10 000 kwachas ($3) to pay for using the roads in the county so we had a lot of kwachas left to change at a bank in Botswana. 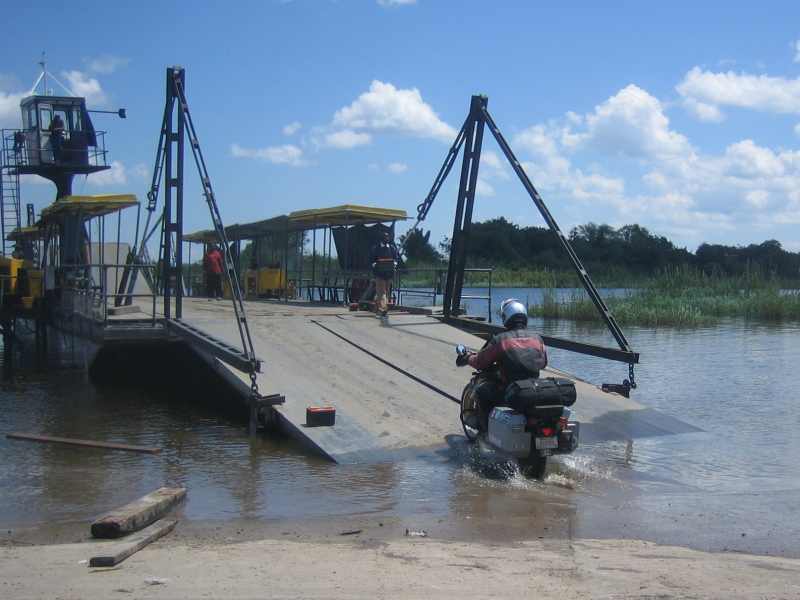 The ferry over the Zambezi River was just arriving. Loading was a bit exciting, riding through the river to get to the ferry ramp. We knew we were upstream from the falls, and really hoped that the ferry wouldn't run out of gas halfway across.